Solar panels made using CIGS cell technology have been increasing in efficiency over the past few years. Although silicon-cell solar panels still dominate the residential solar PV market, a number of advances in CIGS cell efficiency promise a possible increase in the popularity of the technology. While it has been around for decades, CIGS–standing for Copper Indium Gallium Selenide, the elements that comprise the material–solar photovoltaic (PV) technology is the PV technology of choice for just a small number of the world’s top manufacturers. For a while, CIGS technology wound its way in and out of favour as the potential ‘best’ material for solar cells for residential to power plant-scale applications. The main factors dictating the parameters for the definition of ‘best’, however, have shifted considerably over the years, as advances have also been made in competing technologies–most notably monocrystalline, polycrystalline, and amorphous silicon cells. The main 2 factors dictating the suitability of materials for use in solar panels–the cost of producing power from them, and their conversion efficiency (i.e. sunlight –> usable electricity). The cost of silicon cells has dropped dramatically in the past 2 years, but the same cannot be said of CIGS. Even so, efficiency isn’t everything, and CIGS does have a number of advantages over silicon as a PV material: it is less susceptible to the effects of shading and overheating, and its flexible nature lends it to certain applications that wouldn’t suit crystalline silicon cells. In other words, it has potential, and this has been recognised in the industry. However, without maintaining the cost-efficiency balance, CIGS modules will not be commercially viable. Only a few companies to date have managed to strike what appears to be a sustainable balance. Back in 2008-2009 a jump in the price of silicon sparked speculation that alternative technologies such as CIGS might eventually take the throne as the preferred solar PV material. About this time, the USA’s Solyndra–now infamous for filing for bankruptcy after receiving millions of dollars in government loans–began to take off. The company’s claim to fame was its innovative solar module design. In contrast to conventional flat panels, the modules contained a series of tubes, each containing a rolled-up section of CIGS material. The tubes would get direct sunlight for a greater part of the day, and could even make use of light reflected off the surface below them, especially if it was painted white. This boosted the effective output of the modules, bringing their efficiency up to levels comparable to those of flat panels–about 14%. Solyndra’s modules were hailed as revolutionary–they approached the efficiency problem through module design instead of through improvement of the material itself. 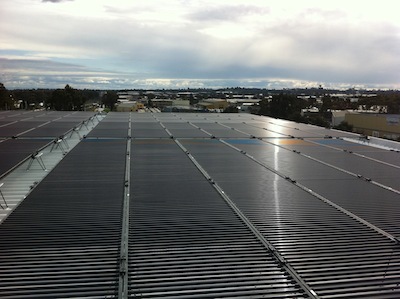 Solyndra’s ‘tubular’ CIGS solar modules on a roof in the sun. Hopes of a quick CIGS revolution were dashed, however, when silicon prices came back down and Solyndra’s tubular modules no longer held a price advantage for most applications. Since then, silicon cells have only grown in their dominance of the market, thanks mostly to the fact that their cost has continued to decline. Although Solyndra may be history, other CIGS module manufacturers and research bodies are still carrying the torch, and advances in the technology have been steady, with a number of major breakthroughs happening in just the past few months. These hint at a turn the tide for the fortunes of CIGS solar modules. Below is a summary of some of the most noteworthy news. It’s also worthwhile noting that in non-CIGS technology developments, but still relatedly (as CIGS is a type of ‘thin-film’ solar PV material), the US thin-film manufacturer and project developer First Solar has achieved 14.4% conversion efficiency for its CdTe (Cadmium Telluride) modules. The company will be using CdTe modules in its 50 megawatt (MW) Macho Springs, New Mexico power plant, which has been noted in PV Magazine for the fact that, once operational, it will be selling its power at a rate lower than a new-build coal-fired power plant.